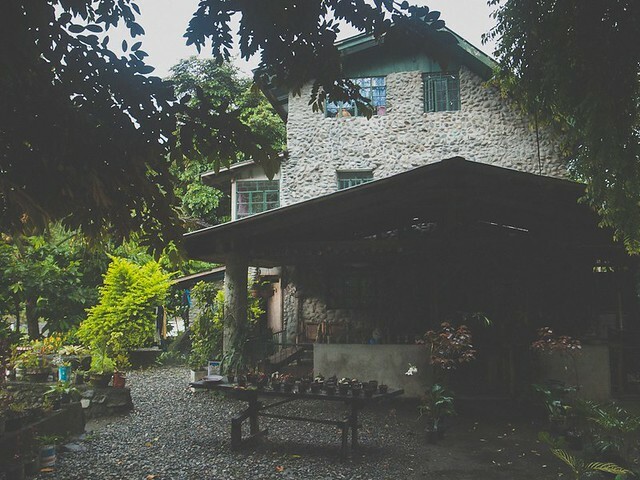 It was late in the afternoon when the jeepney pulled to a stop and told us that we were finally at Sleeping Beauty Inn. Francis Pa-in, our guide, came out to meet us and ushered us in for a late lunch. 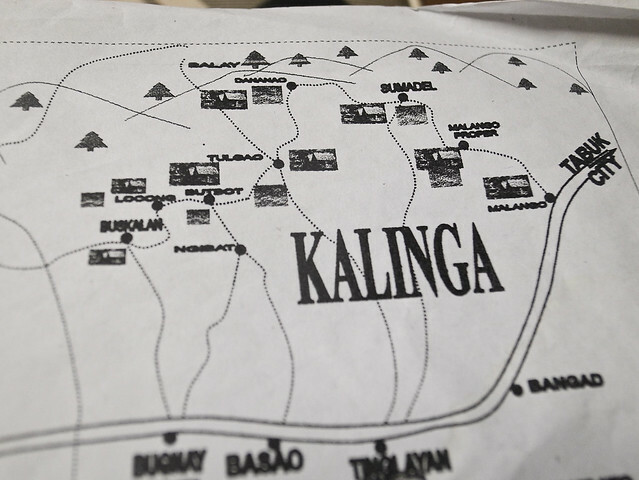 While waiting for lunch, Francis, who by the way is one of the few guides in Kalinga, pulled out a map and drew our game plan. My heart sank when I realized we would not be able to fit everything in. 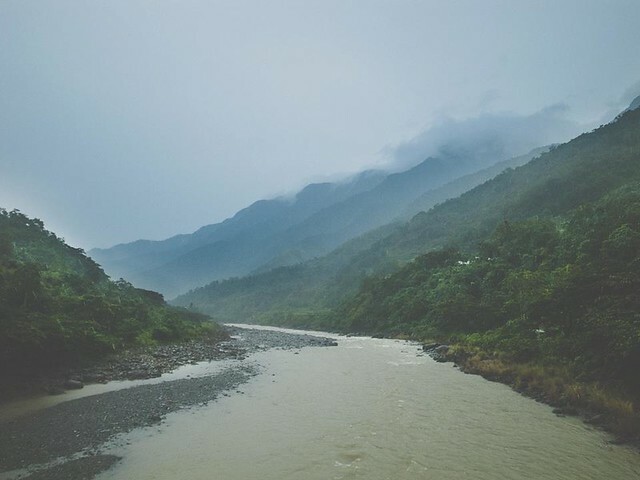 There were several things that we could experience and visiting the different Kalinga tribes alone could take 2-3 days, and taking a dip at the Palan-ah Falls and hot spring would take half a day. Sadly, we had to choose our battles. I roamed around the place and was puzzled by the fact that nearby stores also had Sleeping Beauty in their signage. Why is this town so hooked with Sleeping Beauty? Turns out, I didn't get to research the fact that the mountain right behind us in the photo was named after the Disney princess. See how the ridges look like a side view of lady lying on her back? The town center is smaller than that of Sagada, and only a few houses offered lodging. I think I only spotted two and one of those was Sleeping Beauty Inn, owned by the town mayor (who also owned Sleeping Beauty Restaurant and Sleeping Beauty Grocery, because tough guys dig Disney princesses!). We chose the inn because of its nice location, right smack in a piece of land in the middle of the river. If ever you have fears of crossing hanging bridges like my friend Lea below, you will probably get over it by the time you leave Kalinga. There were no other guests that day so we had the whole house to ourselves. 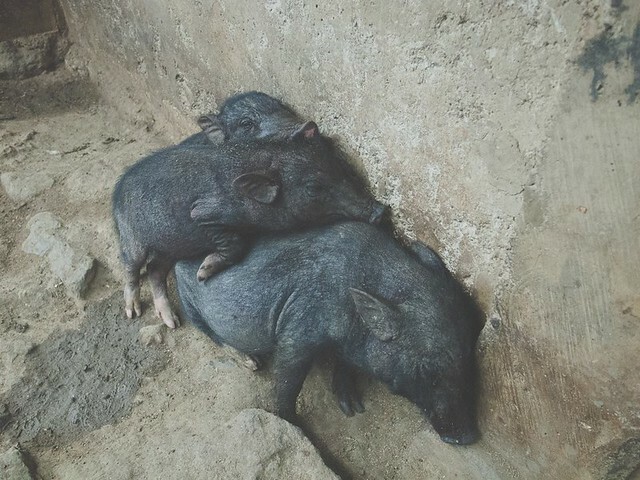 Another noticeable thing about this Sleeping Beauty town is that pigs rule the streets. Pigs were roaming around walking like your usual askals. There were more pigs in the streets than dogs. Tinglayan was Babe territory. We were still fascinated about this fact until the day we left that we already thought of a name for them... babkals (no surprise). What's more fascinating is that the native pigs that all look the same can all find their way home. 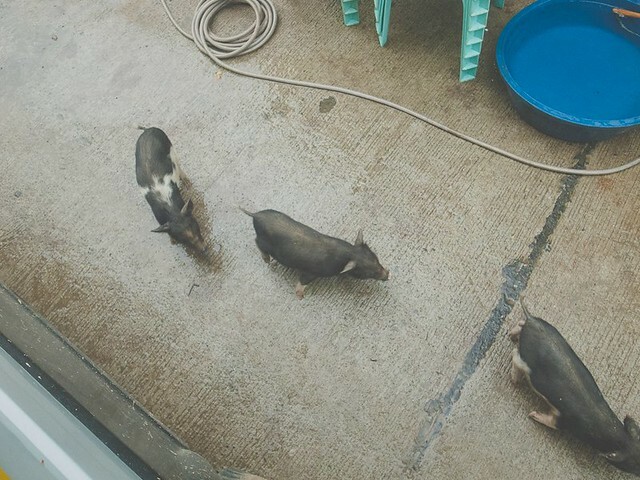 Francis said there's no trouble with the similar-looking pigs since the owners know their pets and the pigs know their owners. Must be love! Since it was late in the afternoon and it was drizzling, we asked Francis to take us around the small town. From one hanging bridge to the next, we made our way to the village of Old Tinglayan donning our rain gear. After 20 minutes, we found the marker for the village. 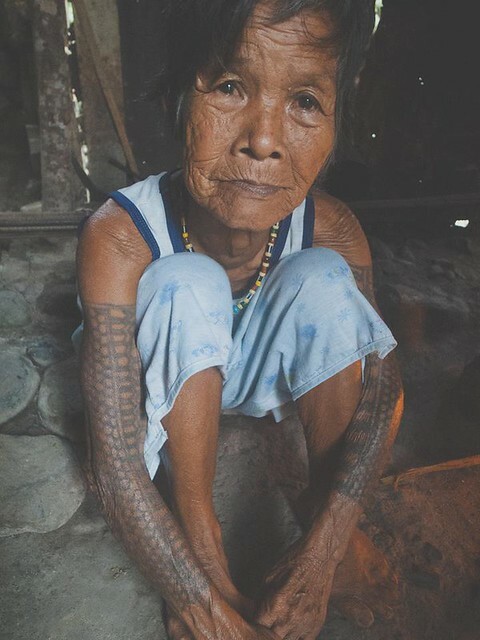 There we met our first tattooed Kalinga woman. Meet Tu-yo. A woman who when asked about her age would say that she does not know because she did not learn to count. She was cooking for dinner when we came and her daughter and grandchildren also came out to meet us. We sat with her at the kitchen and talked with her for a while, with the help of Francis who was translating for us. She was the first person to urge us ladies to get a tattoo so we could get married. Fact: In the olden times, men of the tribes found ink-decorated women attractive. What we saw in Old Tinglayan was a primer of what we were about to experience up in the village of Buscalan. We left Old Tinglayan before the sun set and slowly made our way back to the town center. It was still raining and it was starting to get cold so we gladly accepted Francis' invitation of coffee followed by a few shots of Tanduay and Coke to warm up the night. He regaled us with his stories of more than 10 years of guiding guests in the province of Kalinga. After a couple of rounds, we called it a night. We brought our headlamps out and crossed the hanging bridge for the nth time. The next day was a big one. Time to finally meet the famed mambabatok. 2. From Tabuk, ride a bus or jeepney bound to Tinglayan or Bontoc. **Superb photos by Aaron Arvin Manila. Francis no longer operate out of Sleeping Beauty Inn. Instead, enquire at "Ding-Lash", at the junction of "Lup Lup A Riverside Inn". 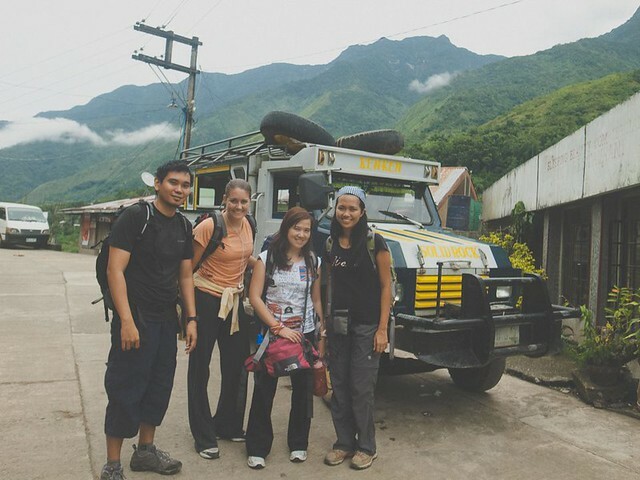 DO NOT trust any guide pushed to u by Tourism Info Ctr, Fenandez, or Inn owner. The one assigned to me was inexperienced, moonlighting fellow who drank too much on the 1st night back to his village & asked me to return Tinglayan myself. Interesting blog but the pictures aren't showing, eh? Thanks for visiting! Photos moved to another server. Done updating the links.